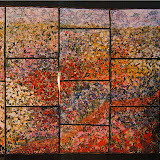 Marriage - 24" x 38"
This piece was made to celebrate the union of marriage between my nephew and his bride in the year 2000. Two shapes join together, yet each retains its identity. 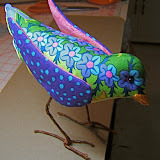 However, a new shape, patterning and coloration is created where they intersect. 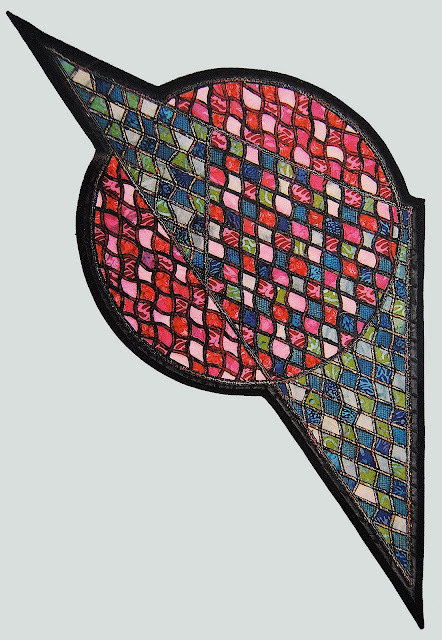 The technique is reverse applique through as many as ten layers of fabric. It is mounted on a foam core board cut to the quilts shape. 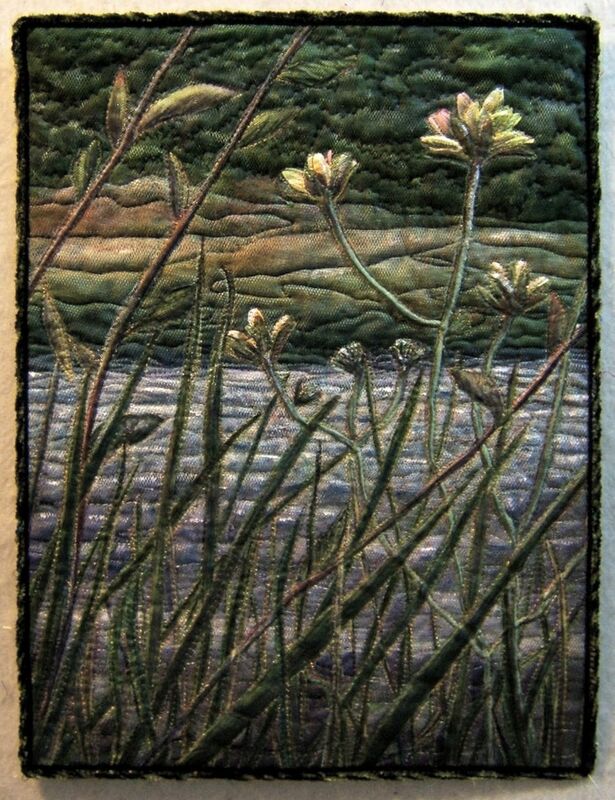 Click on over to the Quilting Gallery see all 17 entries submitted from 5 countries that includes 3 provinces and 6 states. 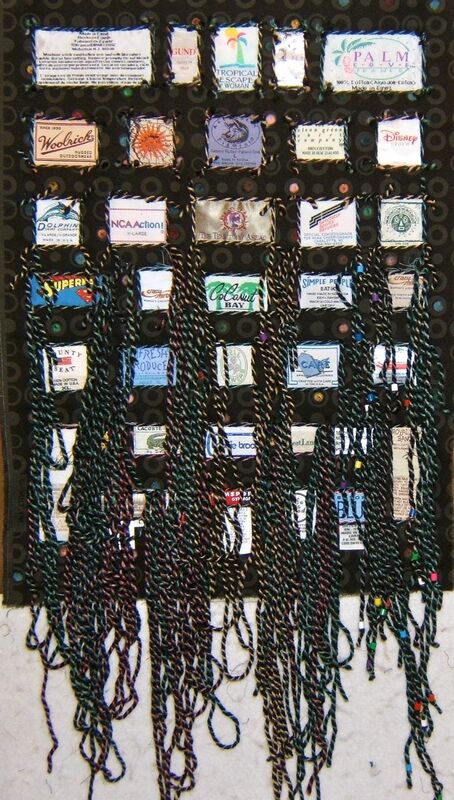 Be sure to cast a vote for your favorite quilt before Sunday at 11:59PM. 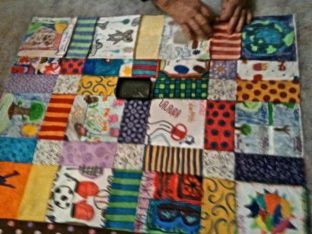 Back in November my daughter-in-law, Terra, called for advice about how to involve children from two classes in creating a quilt for their teacher who's expecting a baby in February. I advised her of several methods for drawing pictures on fabric, which included special crayons and paints, as well as type of fabric. She shopped and experimented. 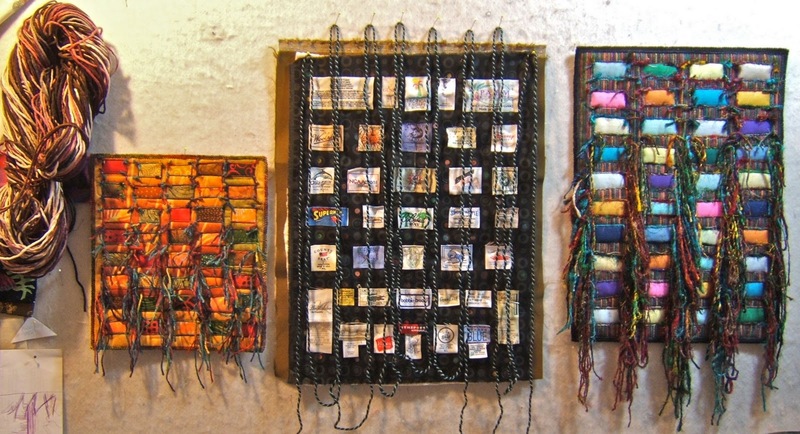 After deciding on what would work for this project, she spent class time, with the aid of the school's art teacher, to guide the kids in drawing pictures for individual blocks of the quilt. 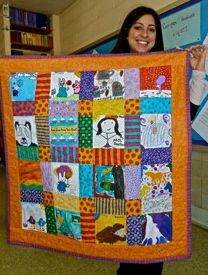 During the holidays, she and I had the pleasure of making those drawings into this quilt that's just been presented to the teacher. 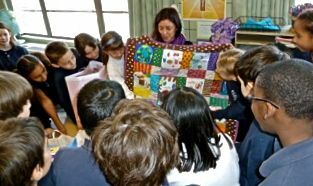 She is thrilled with the gift of this two-sided quilt ... the orange bordered side features one class of student drawings while the brown polka-dotted bordered side is made up of the other class's. 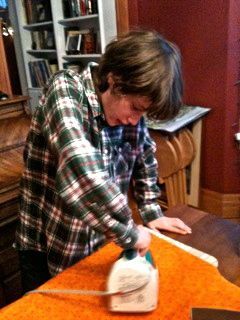 My twin grandsons, who are two of the students in this teacher's classes, helped with the heat setting of the drawings into the fabric as well as ironing the fabric chosen for the sashings, corner blocks, and borders. If the construction hadn't been complicated, I would've had them sewing as well. All the vertical rows of blocks for both sides were first sewn together. 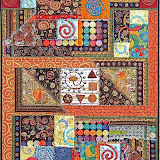 Then the quilt was constructed with a "flip and sew" technique. 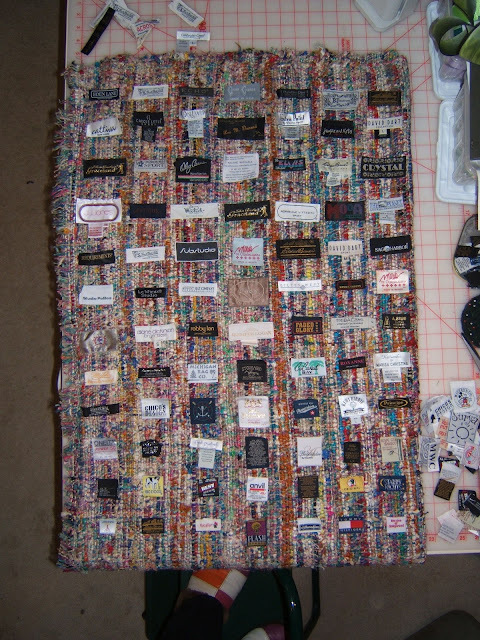 This is a method that is a lot easier to do with a one-piece backing fabric, the batting, and the pieced rows for the top. It was a challenge to align the rows for the front and back with the batting sandwiched between. 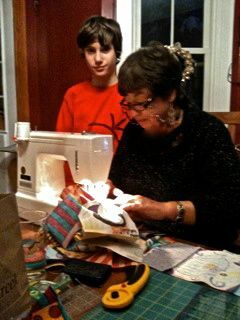 Finally a photo was taken as I was sewing the last rows onto the quilt. In the picture below you can see me pinning a row in place. 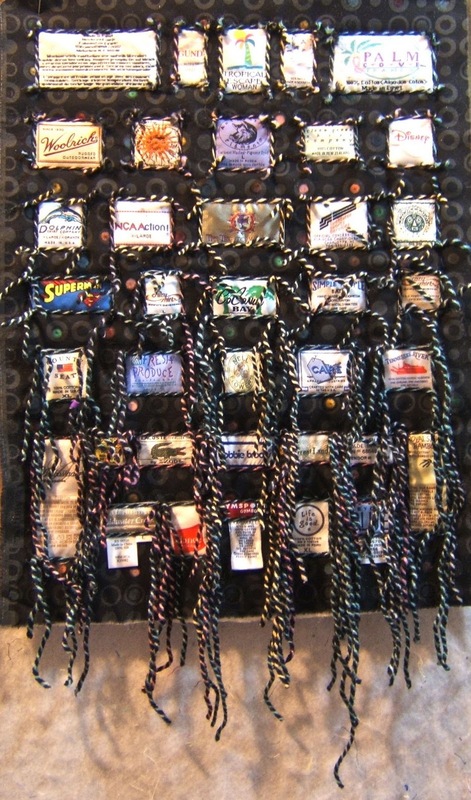 It's lined up with and being pinned to the rows of blocks on the front AND back sides. 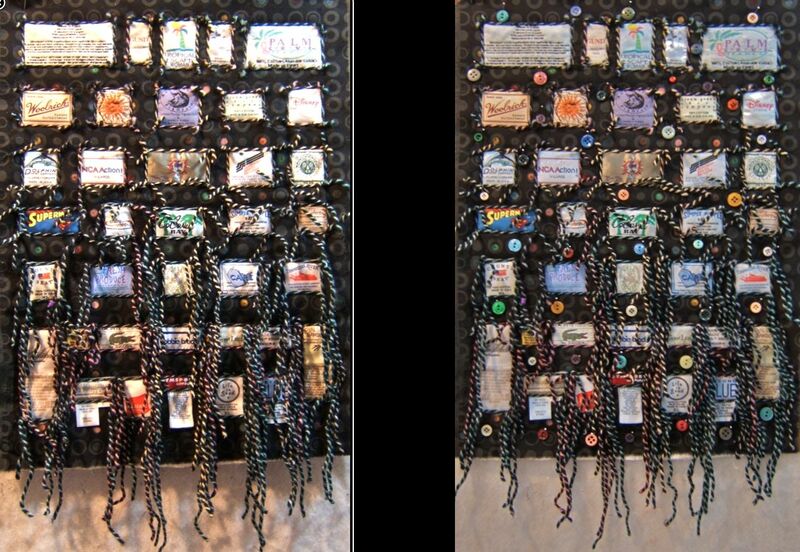 My next step was to turn all this over and then to pin the corresponding row of blocks right sides together to the other side of the quilt through all the same layers. 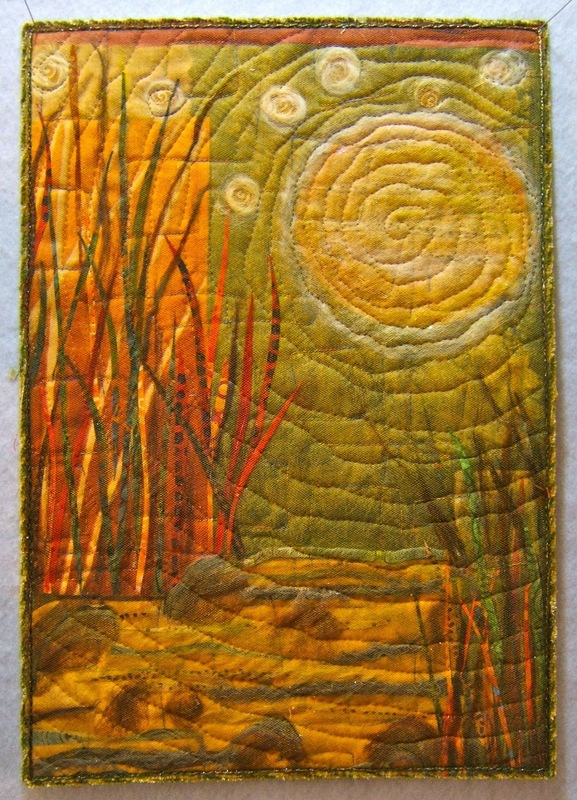 Then I machine sewed a seam through those four layers of fabric with the batting sandwiched in the middle. I decided to construct it like this because I could figure no other way to quilt it that would keep the blocks on the front and back aligned with each other. This presentation is the first time the class got to see the result of their creations. I think they're pleased as well. First, thank you to all who left comments on my last post. I appreciate your suggestions and observations. Between those and input from one of my Thursday Bee friends, Deb, my problems with the smaller clothing tag "unraveled" piece have been "untangled". I resolved the problem of the labels/tags not being cohesive by over-painting the white ones, or their white parts, with a watered down blue acrylic paint. This softened the high contrast ones so they now blend with the others which keeps them all on the same visual plane. My eye now sees them as a group, rather than individual spots. None are shouting and vying for individual attention, but I do feel "invited in" to inspect the more interesting labels. My friend, Deb, had brought buttons and beads to Bee for the project she was working on. 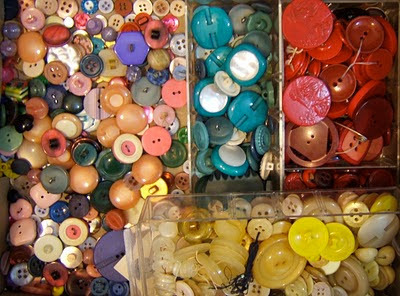 I love buttons and have an extensive collection of my own. Since buttons were on my mind, I was reminded of them when I looked at the painted dots on the black background while I was over-painting the labels. So I got out all my colored plastic ones and pinned a number of them on the piece up on the design board. That's the point where I am now. What a difference these changes have made! 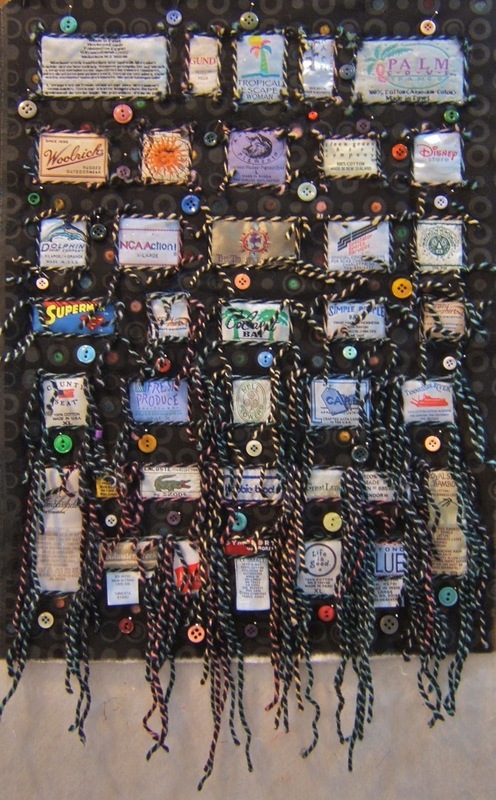 The buttons not only add a liveliness to the composition, but extend the association of the labels to clothing. 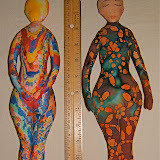 I may add "buttonholes" to the painted and printed dots to carry that idea even further. YEAH! Now I like it. In fact, I like it a lot and am enthused to finish it. 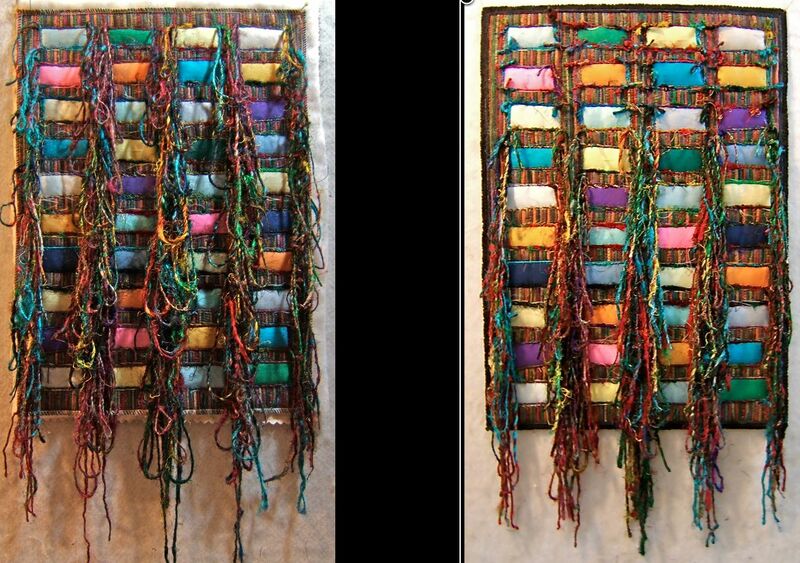 I think its title may be "Untangled". 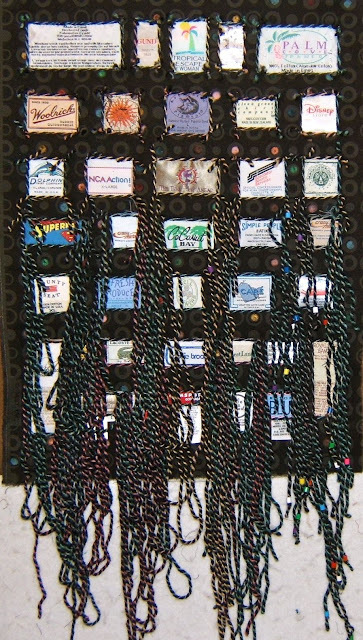 More than a week ago I had couched the black-and-variegated color-twisted yarn to the piece with the clothing labels. Whew! What a massive mass/mess of yarn! Cutting the ends of the tied knots at the corners of the labels in the top rows cleared out a lot of the tangled bulk. 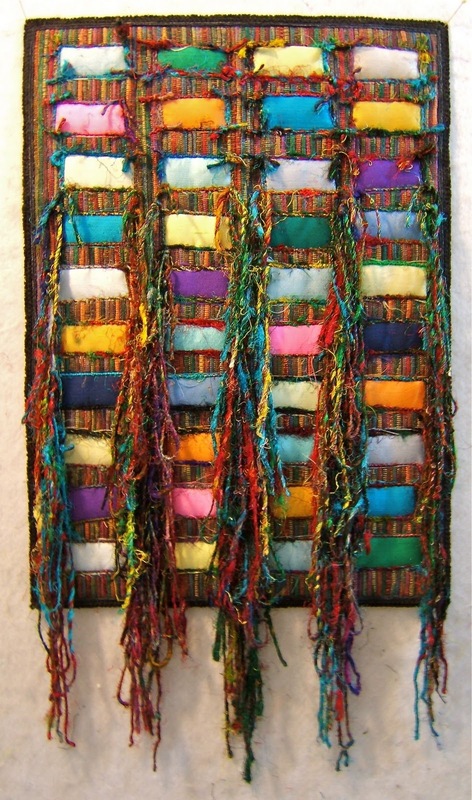 This twisted wool yarn is lighter in weight than the sari silk yarn used in my last unraveled piece. 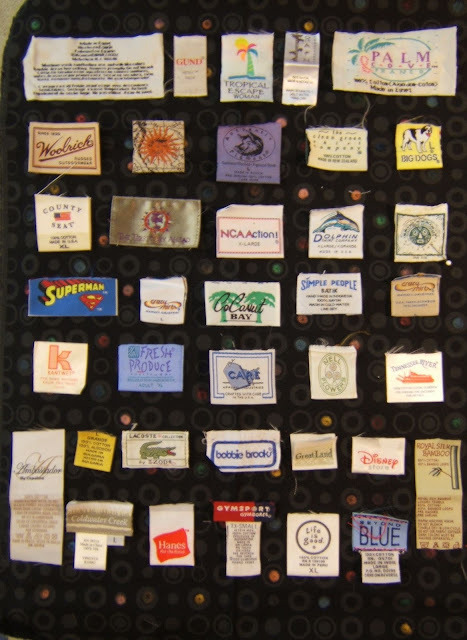 Consequently, the falls made with the wool hang more full and fluffy which covered up the labels in the bottom rows. I experimented with stringing beads on some of the strands to weight them, but decided that touch was "too much", so they were cut off. The fluffy falls weren't my only problem. I don't know how I overlooked the fact that the continual vertical spaces between the labels were more important than the horizontal ones. Those are the channels where the falls hang ... DUH! I ended up cutting many of the wool strands rather short to eliminate the bulk as well as to showcase the labels. Working with this deconstructive process is tricky. It's one snip at a time with lots of studying between cuts. I can live with that much "peek-a-boo", but I'm not crazy about this unraveled piece. It may not get finished. I am still excited by this concept and have laid out labels on this piece of raw silk for my next one. The placement of the labels is a bit rough in this initial layout, but note how the vertical spaces between the rows get wider in the bottom half. Also, I'll be couching silk and silky textured yarns on this one. We've had snow on the ground for over a week which is a rarity. 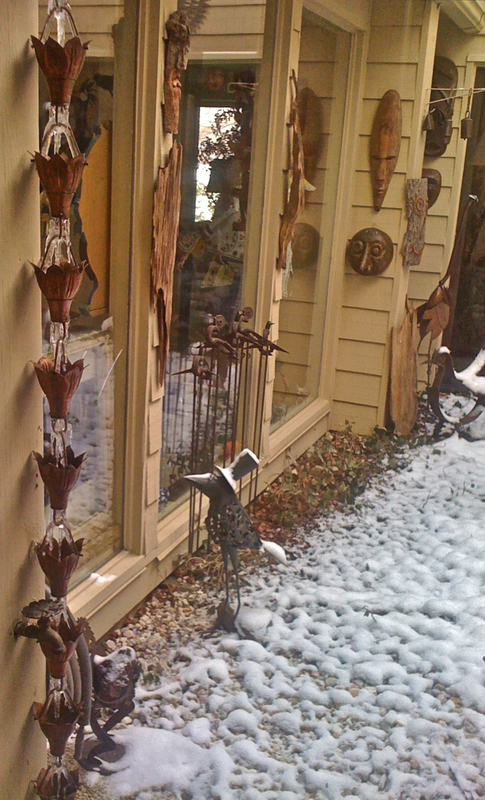 Wonderful ice sculptures have formed in the rain bells that recently replaced the drain pipe next to our front door. 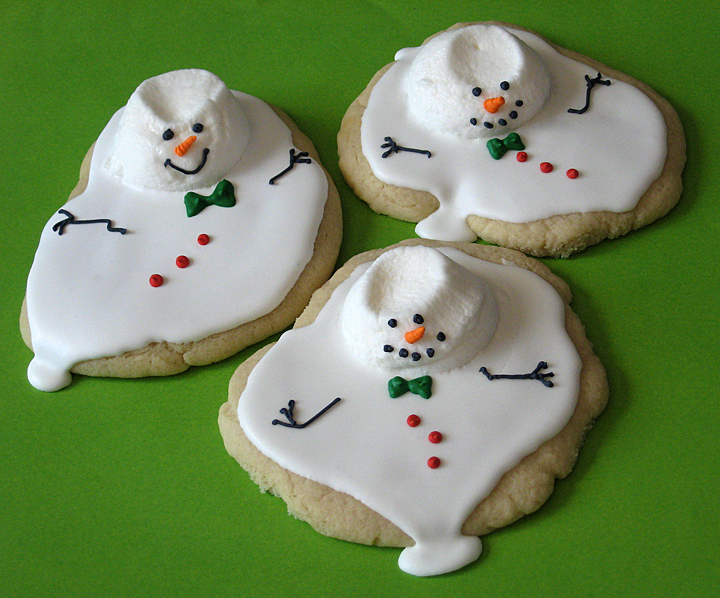 I haven't yet made these too cute to eat cookies. I found them at the Truly Custom Bakery site which has instructions. 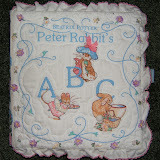 I did, however, make this nest of mice to share with my quilting bee friends for my birthday. You've most likely seen previous posts where I've featured these cuties a couple of times. There are a couple of things I did differently this time. Their ears are toasted pine nuts instead of slivered almonds. The almonds make really cute oversize ears, but they're very fragile and prone to breaking. 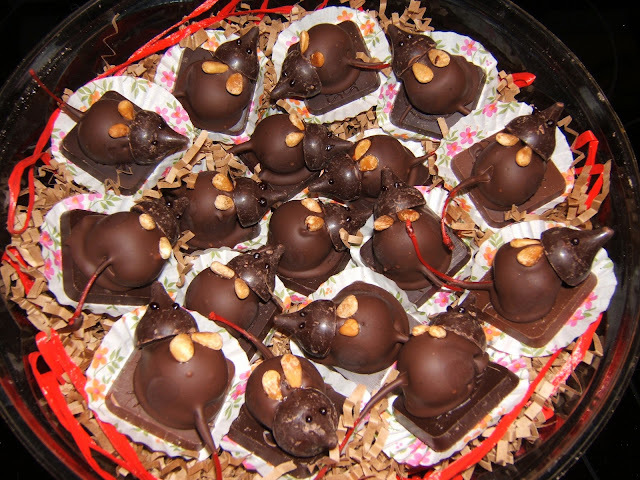 The other addition I've made is to place each mouse on a really good chocolate square. It made for more than one BIG bite ... it took at least 3 before there was only a tail left. 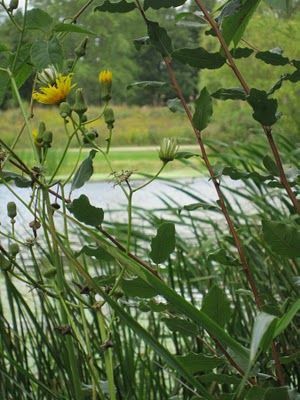 There were a couple of events that led me to the idea of interpreting Barbara's photo of weeds along the Mullet River in Plymouth, Wisconsin under moonlight. One was the winter solstice in mid-December and the other was this piece that was the result of "just playing" (read about it here) earlier that same month. Reveals of the final challenge for this particular Interpret This group began yesterday and continues through Saturday (three each day). Go here to see all the pieces inspired by that one photo and to read the process of how mine was created. I think the clothing labels that I've been collecting for years will work well in this concept. So I spent an afternoon sorting a box full by size and color to come up with this. 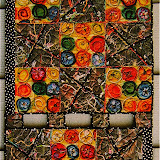 The background fabric is a black geometric print that I had colored with oil paint sticks a number of years ago. 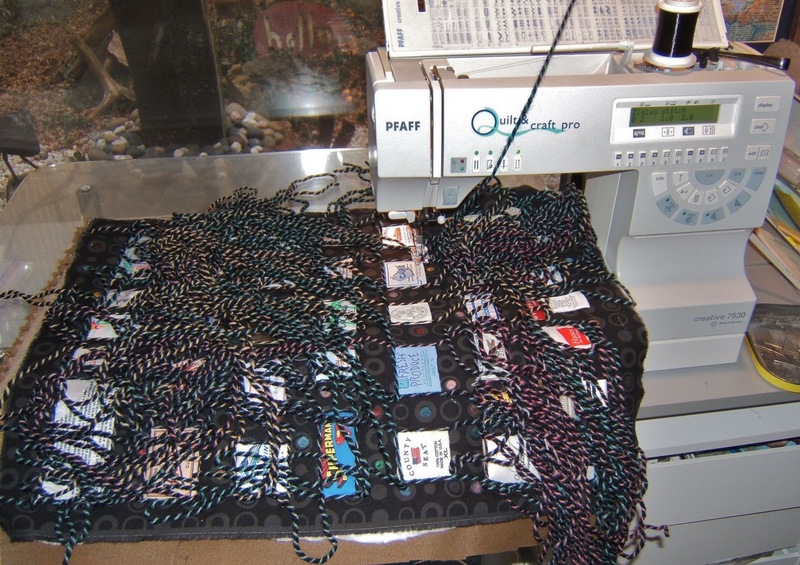 I think a black yarn twisted with a subtle variegated colored one will combine well with the spots of color in the fabric as well as the labels. The basic elements work and I'm excited about the possibilities. 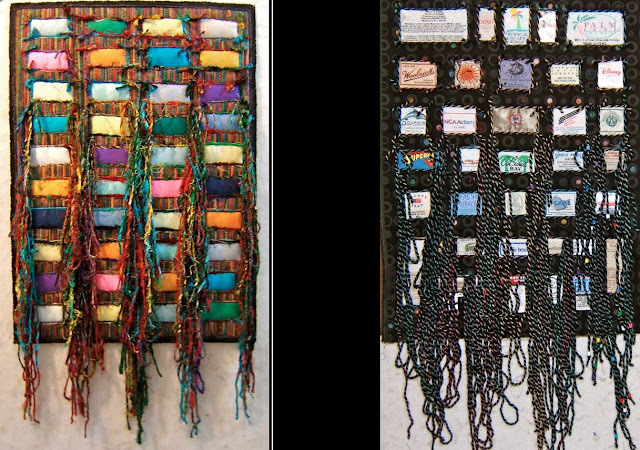 PS: That hank of variegated brown/pink yarn is pinned to my design wall so I won't forget about considering it for a future "unraveled" piece. Another Birthday for the King! 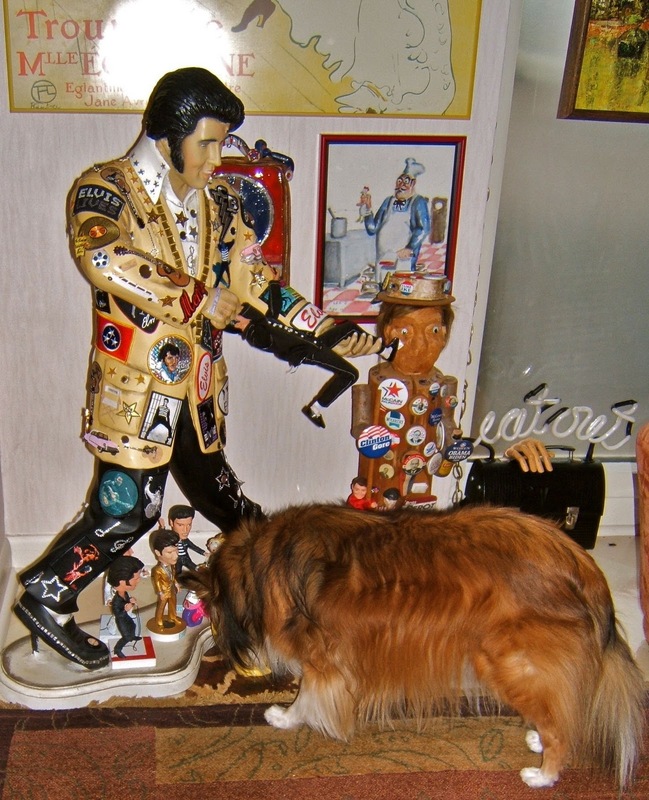 Elvis would be celebrating his 76th birthday today. In our house, he is celebrated everyday. This year he replaced Big Bertha in the cozy corner of our kitchen where our female Sheltie (whose name is Presley) dines. This piece is collaged with Elvis paraphernalia by my husband who is an obsessive Elvis fan. PS: Bertha did not leave the building. She had gotten dressed up for the month long king's birthday party at the Farragut Folk Life Museum (click to see that post) a year ago. 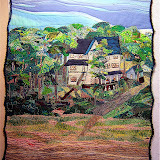 On her returned home she retired to a cozy rocker with a view in the living room. I'd like to say she deserved the "upgrade". But the fact is, she lost her place to this piece that was finished while she was partying. Yikes, my birthday is here ... AGAIN! There seems to be less time between them with every passing year. It seems as though I had just begun my 50th year. 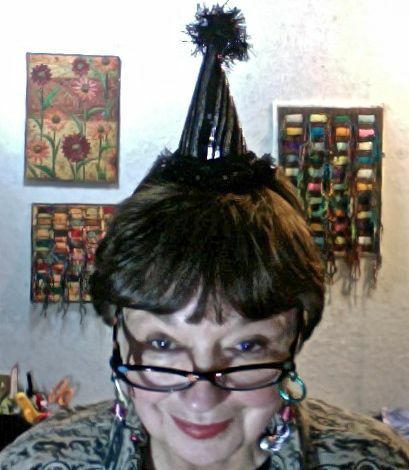 Can hardly believe this day is the beginning of my 70th. I like this greeting sent to me by my niece, Sarah. 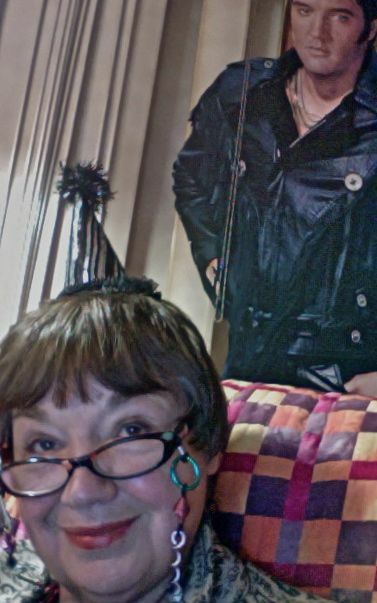 I count myself to be luckier than Elvis, who'll be missing his 76th birthday this coming Saturday. I'm lucky, and thankful, to be fairly healthy and to have the time and energy to create art. 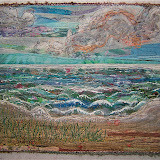 New Years Day was spent cutting loops, tying knots, and couching the edge to finish this piece. 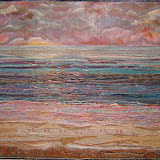 Unraveled II - 13"x 23"
At least, I think that's the title. "Unraveled" may be what I end up calling the series. I know there will be at least one more. This may look just as you remember it from previous posts, so here's a side-by-side of it mid-way done and then finished. It's now a bit more tamed, but still retains a wildness to the mass of yarn. 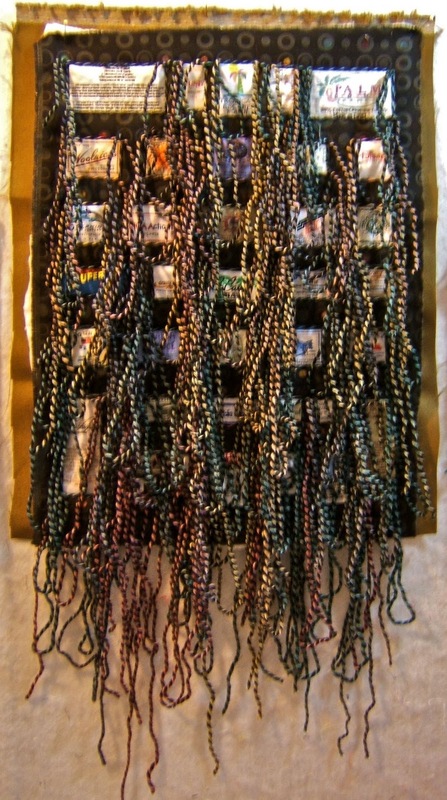 I left some of the loops, but most are cut so the sections would hang in a less messy more contained way. 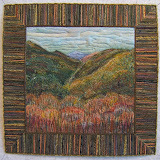 I wanted to expose more of the background fabric to help the eye make a visual connection ... that those loose yarns could be the same as those woven in the ground fabric. I'm pleased with the result. 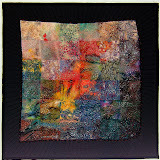 I love the shiny, bright, pure colored silk rectangles played against the coarse, dark, muted background that seems to be unraveling. I'm back in Tennessee, Christmas decorations and gifts are sorted and put away, our house is clean and orderly, and most importantly my studio is clean and organized with cleared work spaces. I'm ready to begin another year of creativity. Now to decide IF there will be a major project that will be my main adventure. If so, WHAT will it be? In the meantime, I'll be playing with several "mess of yarn" projects ... starting (or is that continuing) with the one over my left shoulder. Wishing all of you out there a happy New Year filled with creative adventures!